SBI Clerk Mains Cut-off 2018: Official SBI Clerk Mains Cut-off 2018 and SBI Clerk Prelims Cut-off 2018 are available here. With the announcement of SBI Clerk Mains Result 2018, its cut-off is also announced. Candidates can check their SBI Clerk Mains Result 2018 from www.sbi.co.in/user.htm?action=sbiClkJAMainExamResult. Vacancies are less and the number of candidates increased this year. If we will keep all these factors in mind then we can expect 30% to 40% increase in SBI Clerk Mains 2018 Cut-off. Suppose, SBI Clerk 2016 Cut-off for General Category of any region is 50 marks. 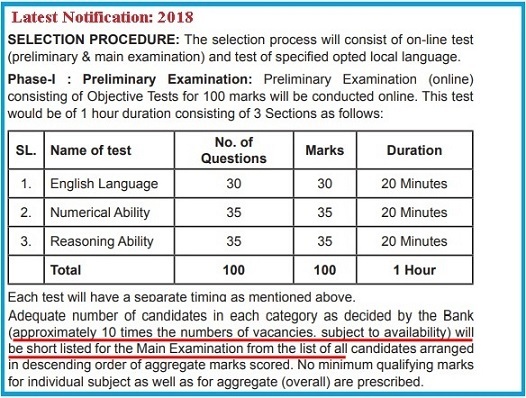 Then, expected SBI Clerk 2018 Cut-off is between 65 marks (or 50 + 15 marks) to 70 marks (50 + 20 marks). In this way, you can easily calculate state-wise expected SBI Clerk Prelims 2018 cut-off. For your convenience, we have also provided the cut-off of the previous SBI Clerk exam. Last SBI Clerk Recruitment exam was conducted by State Bank of India in the year 2016. Why SBI Clerk Cut-off 2018 is expected to be high (some more reasons)? To understand this point, let's have a look at a specific part of previous notification and latest notification of SBI Clerk Recruitment 2018. In the year 2016, the candidates who qualified for the Mains were approximately 20 times the number of total vacancies. But, In SBI Clerk Recruitment exam 2018, this number will be 10 times the number of total vacancies. This is the main reason for high SBI Clerk Cut-off 2018. This year, there are 8000+ vacancies, whereas, in 2016 the number of vacancies was much higher (10,000+) and this is the other reason why SBI Clerk cut-off 2018 (Prelims & Mains) will be higher. So, candidates who are going to appear for recruitment exam of SBI Clerk 2018 will face more competition at each phase of the complete recruitment process. Previous years’ cut-off of SBI Prelims gives you a better idea about this year’s cutoff. The expected cutoff of SBI Clerk 2018 will be high. In the year 2017, SBI Clerk recruitment exam was not conducted. Due to this reason, SBI Clerk Prelims Cut-Off 2017 is not available at Jagranjosh.com or any other websites. But, we can use official SBI Clerk 2016 Cut-Off (Prelims and Mains) for reference. With this data and its analysis, you will have an understanding of expected SBI Clerk Cut-off 2018. Candidates who are going to appear for SBI Clerk Recruitment exams 2018 can plan their preparation strategy accordingly.